When I try to make a piece of conforming clothing for Victoria 4 to fit to Genesis, the dialog box is displayed and presented 2 questions "What figure was the item originally designed for?" and "What type of item is it?" Both lists contain some meaningful selections. When I try to perform the same action on the figure I created, the dialog box is displayed too but there is nothing for me to select. Is there any way to build such support to the figure created by the user of DAZ Studio 4.5? From the sounds of things your trying to use Autofit to fit a Poser rigged conformer to a Tri-ax rigged figure other than Genesis, I'm still working on my Tri-ax converted Aiko 3 (rebuilding the morphs has been a nightmare) so I haven't looked to deeply into this. I think your figure will always show as "unsupported" as you don't need a "Clone" to help reshape the conformers, the “What type of item is it?” requires clothing/hair templates that are rigged and weight mapped to work with your figure, it's this rig & WM that gets transfered to the conformer, without them it's your figures rig & WM that is being transfered. The attached pic shows the templates for Genesis. I think you would need to make clone shapes for the figure you wished to convert from, if I am understanding you correctly and you've created a new base figure to which you wish to AutoFit clothing for other figures. I'm not sure if that's the only requirement or not. I think your figure will always show as "unsupported" as you don't need a "Clone" to help reshape the conformers, the “What type of item is it?” requires clothing/hair templates that are rigged and weight mapped to work with your figure, it's this rig & WM that gets transfered to the conformer, without them it's your figures rig & WM that is being transfered. How to create the clothing/hair templates? Where should I place the templates? In "My Library"? Yes, that's what I want. Is there any instruction of making clone shapes? The templates are just basic clothing/hair shapes, things like "quicksuits", they can even be modified parts of the figures own mesh, some of the ones for Genesis are like that, you just need to rig & WM them so they work well on your figure. Check in "My Library/data/DAZ 3D/Genesis/Base" and you'll find two folders called "Projection Templates" and "Tools", this is where they keep them for Genesis, the files in "Projection Templates" are the loader scripts, these are the exact same kind of files you see in the Content Library when you load clothing in to a scene, the files under "Tools" are the mesh, morph & UV files, and these are the same as the other DSF files you find in the data folder. 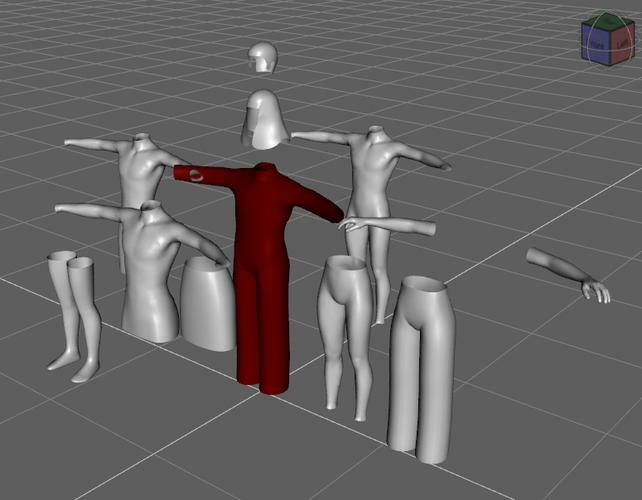 I spent a couple of hours on this last night, clones are morphs, so you need to shape your figure to match the shape, size and default pose of the figure you want to transfer the clothing from, in the case of my Aiko 3 it was quite easy to create clones of V3 & M3, the fit isn't to bad (I've had worse from WW & XD) and if I had clothing templates they might fit better. However those all share the same mesh, cloning from V4/M4 to A3 will require a lot of work in a modeling program, but no where near as much work as making clones for a figure like Antonia. In 4.5 (not sure if it's in 4.0) there is a function under "File > Save as > Support asset" called Clone Asset, but all that does is gives you a file with a list of the bones and morph dials, so I have no idea how it works and need to read up on it myself. Thank you very much. I'm using 4.5 too. I hope the file formats are stabilized. anymore info on making these clone shapes for autofit? still trying to find out how to make these?? i understand the concept of shaping genesis into the correct shape, but i need to know what to do after that to get it into the autofit area of ds. I am attempting to make a clone of M3 for the Gn2 Male. Unfortunately, the only selections I have for "type" is modifier/shape or none. Is there some trick to it? Do I have to have the morph placed somewhere special on import? I have found most editing of files to be extremely frustrating in Daz Studio. Especially when most tutorials for sale don't include basic info...it is assumed that the basic knowledge is already known, lol. There is a tutorial for creating a clone over at hivewive. It is for creating a V4 clone for Dawn but you could substitute your figures where appropriate and it should work. I've been looking at this myself. 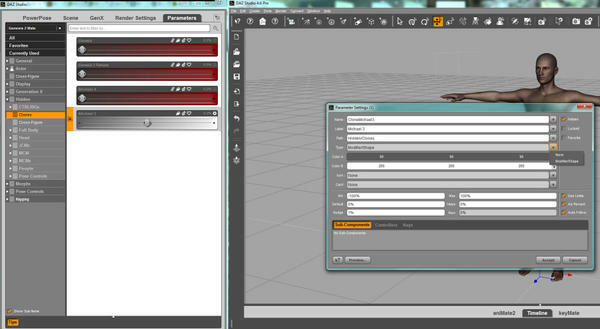 You can actually load the templates into ds and look at them via the open option at least the duf files. the templates go inside the data folder have a look at the structure daz uses by looking at the data files for genesis and gen2. That will help with the folder structure. Loading the templates into DS will let you look at how they are set up. The dress template even has some basic morphs. The gen2 templates look better. One word on creating clones. You can't release clone shapes to others unless you are the copyright holder for the figure. That's way users of Dawn had to create their own clones. The only company with the right to create clones of v4 etc is Daz and vice versa for Dawn. Individuals can create a clone for their own use though.